As a volunteer for The Aurora Center, I am expected to attend monthly volunteer meetings. The meetings are supposed to bring us together, remind ourselves that we are a connected team, a working community. Last Saturday, we had a self-reflection exercise. Jerie, our volunteer coordinator, sat in front of the semi-filled classroom, grinning softly as we bumbled around finding seats, shoving the provided bagels in our sleepy morning mouths. Today, Jerie alerted us we were going to do a self-reflection exercise. I encourage you to do this exercise as well. It was a meaningful practice for me, even on a Saturday morning (when I should be in bed, thank you very much), and I am sure it could be an enriching experience for you. Choose one or two words to follow this phrase. These words can be traits, duties, roles, whatever feels right for you. 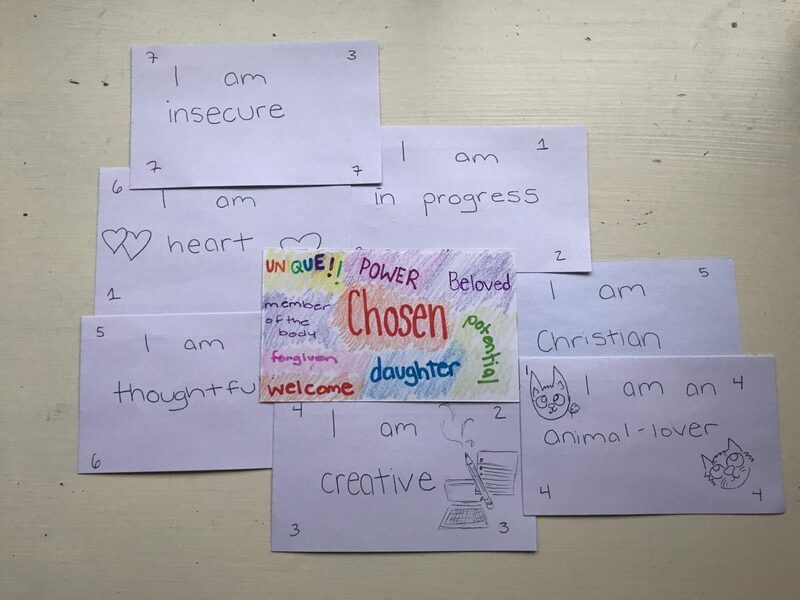 On the upper right hand corner of each notecard, rank (1-7) the words that you see yourself most often as. On the lower right hand corner, rank each card by how you most want to see yourself. On the upper left hand corner, rank each card by what you think others see in you most often. On the bottom left hand corner, rank each card by what you want others to see in you most. Reflect. Did most traits get the same score? Which ones differed? Which ones did not? There isn’t necessarily a definable “good” or “bad” with having matched or mismatched scores. 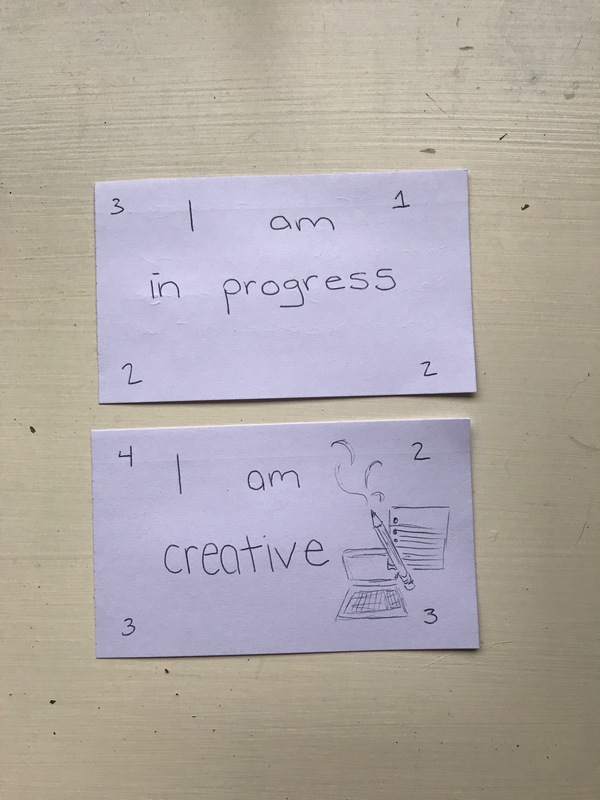 However, this exercise allows you to think critically about what parts of yourself you’re pushing down or allowing yourself and others to see. This exercise reminded me a bit of the story of Moses. Being a Hebrew in a time when Hebrews were persecuted and enslaved most likely led for a complex self-identity. Had it not been for a stroke of seemingly random luck (the Pharaoh’s daughter finding and adopting him), he would not have survived even infanthood. As an adult, Moses probably tried to push down the aspects of himself that made for a difficult childhood; the possible confusion about why he was chosen to survive when so many others did not, his disconcerting closeness to death as a child, and what his responsibility was in stopping violence against Hebrew slaves. As Pastor Kate mentioned in her sermon two weeks ago, seeing his Hebrew brothers and sisters suffering while living in the house of their persecutor must have been extremely confusing and painful. Years later, an adult was living a simple life as a farmer, drifting away from the confusing self-identity of his youth, when God showed him a burning bush and brought all the pain back. God let Moses see, once again, his bizarre position of growing up next to (and most likely learning from) successful leaders, but also having great sympathy for the enslaved Israelites. God showed Moses that the most painful, messy parts of his identity also gave him the most potential. God called Moses to lead his people out of hell on Earth, and after a bit of complaining, Moses agreed. 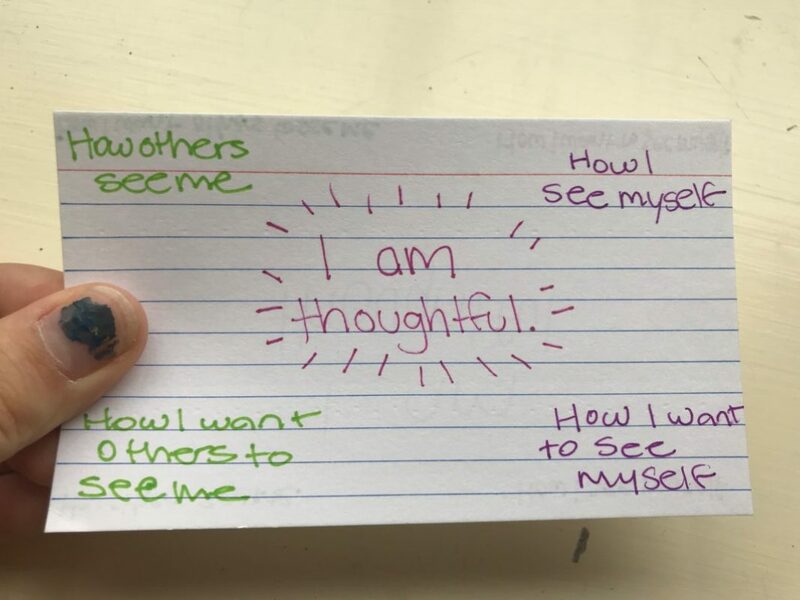 I see this same paradox occurring with my least favorite notecard “I am insecure.” While it was a trait I highly identified with, I least wanted others and me to see my insecurity. Obviously, I have some work to do. My insecurity, though problematic, has strengthened my ability to be an advocate for Aurora. I am able to meet a client where they are at, listen with an open heart, and not shove advice on a client; the understanding that I don’t know what is best for someone else feels very natural to me. Also, I am willing to change my strategy if they need different things from me when they make a call; I am not so concrete in my style that I am resistant to change. Owning that I am insecure about what I am saying and how I am presenting myself allows me show my own vulnerability and awkwardness with the client. If I am not being my true self, how can I make space for a client to feel comfortable sharing the worst experience of their lives? Whether you felt empowered by your chosen traits or disappointed by them, God created you with a purpose in mind. Good, bad, congruent, or mismatched, I believe all of us is formed with God’s knowing hands. Moses sees his speech impediment, God sees potential for an advocate and leader; I see my insecurity, and God sees my open-heartedness. If God were to write you a notecard, what would it say? On move in day, I walked through the hallways of Territorial Hall—squeezing past piles of cardboard boxes and random futons parents had placed in the already narrow halls—and shoved moving carts back out to the front entrance. The influx of 700 new residents created a couple busy days for me and the other Community Advisors (CAs). It felt simultaneously like a decade and a minute since I had been moving into T-hall myself as a freshman only a year before, and here I was again at the start of another school year; except this time was different. Once the parents said their long goodbyes, my residents were left to their own devices. Some emerged from their rooms and began talking to each other, asking surface level questions about majors and hometowns. Freshman would probably tell you that one of the biggest anxieties of starting college is finding friends. For many, this is the first time they’ve been thrown into an entirely new and uncharted territory. Last year, I came to the U where I only knew five people out of 30,000 and those five were high school classmates I wasn’t even close with. College can be an amazing time to meet truly genuine people and form life-long connections. However, the intense pressure we feel to establish a friend group can lead to us putting up facades in order to fit the mold of the first friend group we find in a desperation to feel belonging. Sometimes we transform into people we don’t recognize just to fit in. As a CA it’s a huge part of my job to make impactful connections with my residents. We regularly talk about how to make meaningful connections in staff meetings, and my boss will have weekly check-ins to see how these are developing. I’m supposed to be someone they can come to with their roommate issues, questions about school or just feel comfortable talking openly with. From the comfortable distance of one year of college experience, and in my new role as a CA, I got to watch freshman interact in ways that were all too familiar. The fragility of the new connections prevents the presence of vulnerability in our relationships. Maybe it’s trying to hide the fact that you’re homesick, or that you regularly struggle with a mental illness, or that you don’t love college life as much as everyone said you would. Instead we have to appear perfectly put together. The absence of real spaces means these deep parts of ourselves are bottled up inside, weighing us down. We become too busy trying to cover up these very real conflicts in our lives, that we’re too afraid to be real. Being honest and real about our beliefs and struggles is a conflict that has existed for, well, forever. Martin Luther was a guy who had some issues with the Catholic Church. In fact, he got so fired up about it he nailed a list of his grievances on a door, all 95 of them, a bold move that we’re celebrating the 500th anniversary of this year. His willingness to be open about his discomfort, and the dissonance he felt in his beliefs, led to a formation of an entirely new way of looking at God: through a lens of grace and forgiveness. Luther’s new ideas weren’t exactly welcomed with open arms. The Catholic Church didn’t throw him a parade and toss roses at his feet, they were actually pretty unhappy with him. Being real sometimes means taking a risk that people won’t like who you are, or what you have to say—a step that can be intimidating and scary. Luther took the initiative to create a new space in which he could be real about his ideas, and find common ground with others who shared his frustrations. Participating in spaces where everything about ourselves is celebrated and accepted—even if we don’t all agree on it—is vital to our spiritual, emotional, and physical well-being. God knows who you are. God loves and accepts the parts of us we have a difficult time admitting to others, or even ourselves. Immersing ourselves in real spaces permits us to see the infinite bounds of God’s love and God often manifests that reminder in people we find sitting next to us in these real spaces. Real spaces surround us with people who celebrate the people God has made us to be and the people we are striving to become. LCM has been that source for me; it has challenged me to be honest about who I am, showed me the boundless acceptance of a community that strives to grow, and challenges our ideas of who we are and who God is in the world today. Luther didn’t upset the Catholic Church so he could sit at the cool kids table. He relished in his own vulnerability and was real about his beliefs. Be real about who you are and find spaces that support you in moments of vulnerability. When we practice a life of authenticity, and surround ourselves with people who celebrate the people we are and the people we want to become, we’ll hopefully find a life of joy. Real spaces combat a world that tells us we’ll never be enough. Real spaces are a celebration of the “city kids and country kids, introverts and extroverts….the Engineers and English majors, questioning and certain, poor and rich.” All are a part of the body of Christ. Actively seek out spaces where you are reminded of the boundless acceptance and love God has for you each and every day.